Welcome to Time-Management-Central.net! Our free time management tools and resources will assist you to have more time and more work-life balance. Your time is precious. The importance of time management has never been greater than it is today. Most people today find they run out of time, can't find enough time or time just gets away from them. Time is your most precious resource today, because it is limited. We can't create more - there is only 24 hours in a day. But still our lives seem to get busier and busier. There are thousands of books, courses and electronic gadgets to help you manage your time. But do they really work? Have you tried various time management systems and techniques without much success. Maybe you used some time management tips that worked for a little while, then you stopped using them. If you would like to find out what works for other people then time management central is for you. Time-Management-Central.net was created to provide you with the most practical tools, techniques and reviews to help you get control of your time! At Time Management Central we are committed to providing proven, easy-to-implement, time management resources help you find more time. We are committed to sharing with you the time management tools that add-value for our visitors. Examples include: time management techniques, quotes, articles, surveys, checklists, activities and workshops, resources and more. Whenever we identify a new tool that provides a great solution to a common problem, we add it to the website and let you know through our blog and newsletter. We see that the most effective people are constantly seeking to grow in their knowledge and their skill-set. Those who don't continue to sharpen and grow their arsenal of time management tools and resources, soon find themselves falling behind others, becoming ineffective, stressed and not able to achieve their goals. Time-Management-Central.net is filled with a wide array of tools, resources, and high-value information that can assist you to be more productive and achieve more in less time with less effort. Don't get left behind!See what time-management-central.net has to offer and add these valuable, results-focused tools to your time management tools. 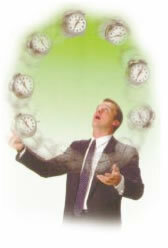 Business time management and personal time management at work are critical if you want any life balance. I believe success and enjoyment of your work is dependent on effective time management. Though iOS and Android have a definite lead in terms of the total number of apps available, BlackBerry business phones support an equally impressive roster of mobile software programs. When it comes to finance, they may even have an edge over the iPhone and the various Android handsets thanks to RIM's focus on online security and Email integrity. Here are a few choice financial apps for your BlackBerry. Time management free course. A modern, 21st Century approach to time management. Top 10 books on Time Management summarised to make it easy for you! Time management strategies for the 21st Century. Old time management systems no longer work. time management expert Michael Erwin.